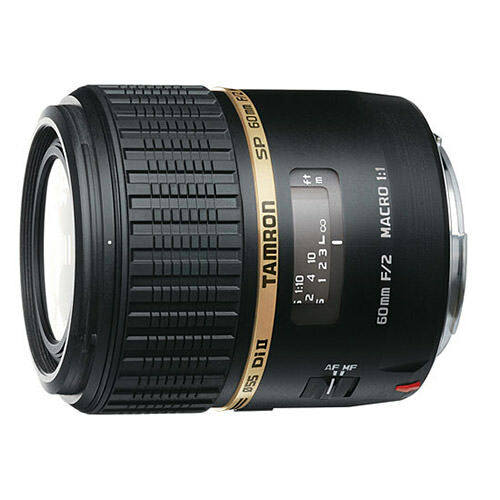 Lens Description: The SP 60mm f/2.0 Di II Macro derives its exceptional imaging performance from one of photography\'s revered optics—the Tamron SP 90mm F/2.8 Di Macro. The SP 60mm F/2.0\'s focal length and digital imaging design properties bring the picture angle characteristics and macro performance of the SP 90mm to APS-C format photographers. A remarkable best-in-class F2.0 maximum aperture enables low light shooting at lower and more desirable ISO settings. Producing a picture angle equivalent to a 93mm lens on a full frame DSLR or 35mm film SLR, the SP 60mm is ideal for portraiture and general photography. Here too, the F2.0 maximum aperture extends creative opportunities by rendering attractively obscured backgrounds and foregrounds. The heart of the SP 60mm enables breathtaking close-up images with a reproduction ratio up to 1:1 (life-size). Precise Internal Focusing (IF) is augmented by full-time Manual Focus control which makes fine tuning easy.